Click here to visit their site and click “Vote Now” on one of their stories. Then enter your email. On the next page you should see “Enter Sweepstakes.” Fill out that form and you’re done! 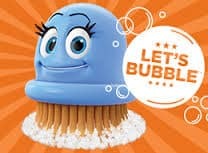 905 winners (5 per day) will score a free Plush Scrubby and a coupon good for $2.00 off any Scrubbing Bubbles product. Good luck!